Windows 10 released an update in April 2017, where Paint 3D was introduced. Paint 3D is not an upgraded version of MS Paint, this tool comes with 3D image making tools and some basic 2D editing. There was rumors on social media that it's the end of MS Paint, which raised a lot of hue and cry from MS Paint fans. Now Microsoft has announced that MS paint will no longer be installed by default, but the app is available for free in the Windows store. "MS Paint is here to stay," Microsoft said in a statement Monday evening following an "incredible outpouring of support and nostalgia" for the app. "If there's anything we learned, it's that after 32 years, MS Paint has a lot of fans," Microsoft's statement said. "It's been amazing to see so much love for our trusty old app". Ms Paint has been part of the windows operating system since 1985. Users liked this program due to it's simplicity and versatility. First released with the very first version of Windows 1.0 in 1985, Paint in its various guises would be one of the first graphics editors used by many and became a core part of Windows. Starting life as a 1-bit monochrome licensed version of ZSoft’s PC Paintbrush, it wasn’t until Windows 98 that Paint could save in JPEG. Now it's available as a free app in Windows stores. It's applicable for operating system windows 10. 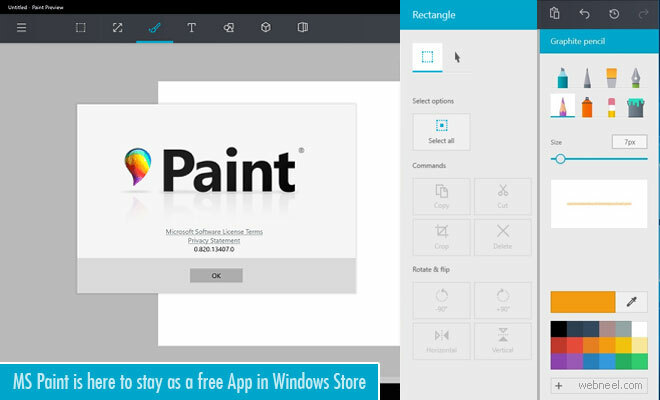 MS Paint has another chance - Available as a free App in Windows Store Neel Windows 10 released an update in April 2017, where Paint 3D was introduced. Paint 3D is not an upgraded version of MS Paint, this tool comes with 3D image making tools and some basic 2D editing.